Technology hubs, innovation spaces, hacker centers, incubators, telecenters, libraries, co-working offices, etc., there are many names to call the places where like-minded people come together to focus on a challenge. We do this because we believe in them as a model for facilitating collaboration, yet at the January Technology Salon in DC, we asked Do Tech Hubs and Innovation Spaces Really Work? I personally like this definition as it focuses on capacity building – growing the skills of the community as a key goal and success metric. Working in the OpenGov Hub, I certainly see this on a daily basis. Members of disparate organizations are all learning and collaborating with each other to achieve a common goal. Then, Should the Development Community Be Involved? The “hub” movement across Africa is often portrayed as a grassroots network of self-replicating innovation spaces that developed independent of donor or outsider support. However, iHub Nairobi, arguably the flagship African tech hub, was made possible with funding from the Omidyar Network and Hivos. infoDev at the World Bank funds mLabs and mHubs and many of the African tech hub founders have roots or very strong connections in OECD countries. As a result, we can say that this question is moot. The development community is already involved innovation spaces – in Africa and around the world. We all know that collaboration happens when you bring people together, and we can assign many intangible outcomes to places like iHub Nairobi, but what empirical evidence do we have that tech hubs have impact? To start with, innovation spaces should not be evaluated solely on economic outcomes. Building an ecosystem of excitement, skilled participants, and then organizations of those people that then develop products or services for others is a years-long process. Commercial incubation centers take 5-10 years to fully mature, we should not expect socially focused innovation spaces to be overnight successes. In addition, the physical space and the community building that comes from bringing people face-to-face is a powerful outcome in of itself. This “buzz” is hard to measure yet key: new technology is cool, and everyone loves a flashy, shiny, new app, but people are cooler. We must not lose sight of the human side of innovation. In fact, the real challenge is turning this buzz and energy surrounding innovation spaces into a sustainable, durable development process that excites the larger community to recognize the value of the innovation space and join the innovation space participants in effecting lasting change. Finally, What Works the Best? Is there one type of innovation space that works better than the other? Short answer: It depends on your goal. In a country like Liberia, the iLab is focused on basic technology skills training. 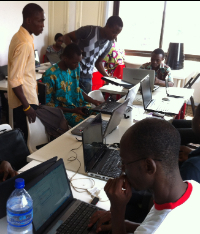 While in Benin, eTri Labs has hackathons and supports indigenous hardware design. ActivSpaces Cameroon is a startup incubator, Hive Colab Uganda is a coworking space, and iHub Nairboi supports everything from training to venture capital funding. Best is to do research on what others are doing – here are 30 innovation spaces resources and research links Salon participants compiled before the meeting to inform our discussion. And if you’ve read this far, you may want to apply for a consultancy with Unicef to launch innovation labs in Central and South America using their excellent Innovation Labs DIY Guide. Join us for the next Technology Salon – sign up to get invited.